Many people think that going solar, or putting solar panels on your home, will cost SO much money that they don’t even bother looking into it. 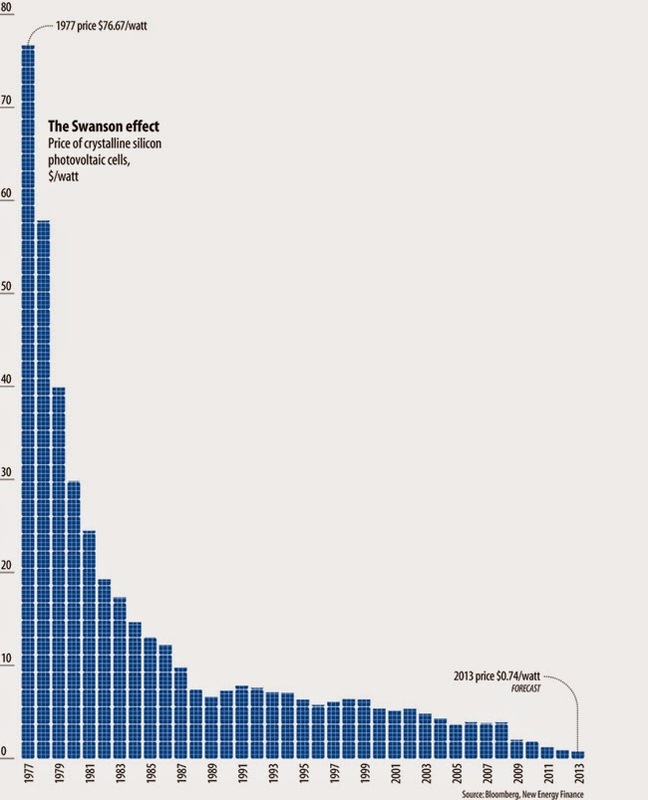 The fact, however, is that going solar today is 100 times less than it was in 1977! There has never been a better time to buy solar paneling in the history of solar energy than now, in 2014. Thomas Edison, a man known for his brilliance saw the future in many ways, and made it a reality in his own day. One of his “visions” was solar energy, even as it was so little understood back then, and he said, “I’d put my money on the sun”. I know there are people who consider genius minds to be a bit eccentric, but that’s the one thing he was not. He was a realist and a doer, and saw the future of solar energy as a very practical money-saving matter. It turns out he was right. Investing in solar paneling for your home isn’t a question of how much it will cost you so much as it’s a question of how much it will save you. The above graph illustrates this very point. What the graph doesn’t show is how the map of the US and other parts of the world light up when shown as a solar map of those who have gone green – it’s a well lit map and is only going to grow as it’s catching on just about everywhere. New methods are being devised that are designed to lower the prices for you on a constant basis. Give your local solar company a call to find out how much you can save by going solar today.